I’ve had the older version of this model for a number of years and swear by it – it’s fast, accurate, and easy to read. There’s no better instant-read thermometer out there. In fact, it’s so good that I often find it missing from my grill drawer because my dear wife is using it inside. Thermoworks posts deals and give-a-ways on their site. I signed up for the RSS feed from their blog, and within about a month they announced that they had open-box Thermapens for $69 plus shipping. That’s a $20 savings, so I jumped on it. 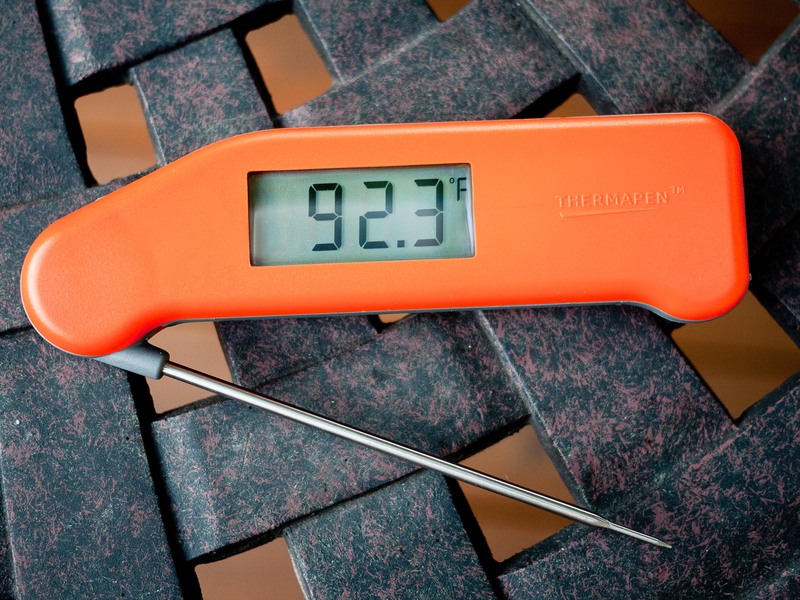 The new Thermapen performs much like the older version, and that’s a good thing. It gives you precise internal temperature readings in 3 seconds flat. There is no on or off button, swing the probe out and it’s on (and yes, it was a hot one the day I got it). The very thin tip slides right into the meat and gives you a reading at the center of the food. The hole it leaves is so small it usually seals up right away and doesn’t let the juices leak out. The new version adds a splash-proof seal, which is nice since my grill table isn’t as water-proof as I would like. You don’t want to go scuba-diving with it, but it’ll shake off a rain storm. It also has a new bacteria-resistant case to keep you from getting the gleep. The new probe doesn’t have the old lanyard, but I didn’t miss it. In fact, one of my frustrations with the old probe is getting the probe caught on the strap. This is a really nice redesign of an already great product. Thermoworks kept all of the features that made the previous version so handy and added a couple of valuable tweeks that I really appreciate. I’ve lost a couple of cheap timers due to water damage, so if the splash-proof seal works as advertised, it’ll more than pay for itself. I love my non-splash proof thermapen and run into the same problem as you….my wife steals it when blooming yeast for baking. I wanted the red one, but they were out.